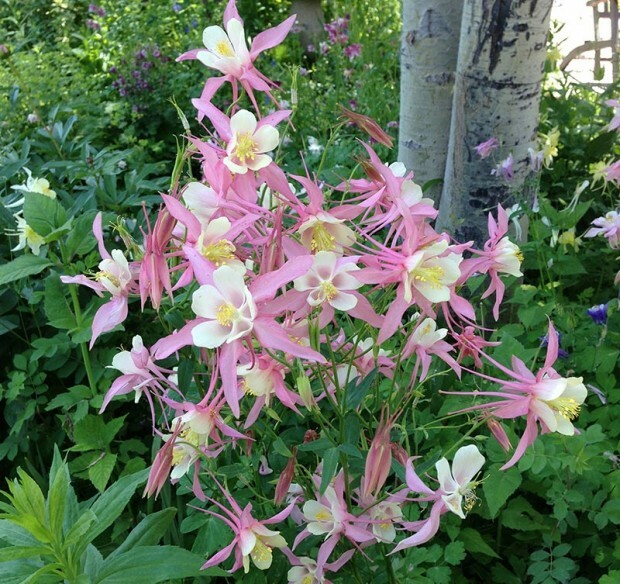 A garden without columbine is simply incomplete. Columbine (Aquilegia) comes in a wide range of colors. It produces masses of brilliant 1-to 2-inch flowers that are exquisite when appreciated up close as well as from a distance. They grow in light to moderate shade and flower from late spring to early summer for about 3 to 4 weeks. During this period, few plants can produce a show of color that rivals this one. As an effective source of color, no shade garden should be without this plant. Most columbine varieties are readily available since this plant grows from seed that is easy to find. Young plants that have not been subjected to a sufficient cold period usually do not flower during the first season. By the second season, columbine will reach its peak and flower profusely. By the third year, plants usually decline in performance and will rarely overwinter for the fourth season. This is one of columbine’s shortcomings and should be realized before a gardener’s expectations are not met. However, many columbines drop seeds after flowering that may germinate and produce offspring in a similar color range. Dwarf varieties, called fan columbine, also exist. These only grow about 6 inches tall and come in blue or white. The native varieties like Aquilegia canadensis and Aquilegia crysantha have bicolored red and yellow blossoms and all yellow blossoms, respectively. These flowers are a little smaller but these two are best for reseeding to naturalize a shady area. For the enthusiast, collector or obsessed gardener, several unusual varieties can be found. Look for ‘Ruby Port’ which has interesting fully double maroon-red flowers—spectacular when viewed up close! 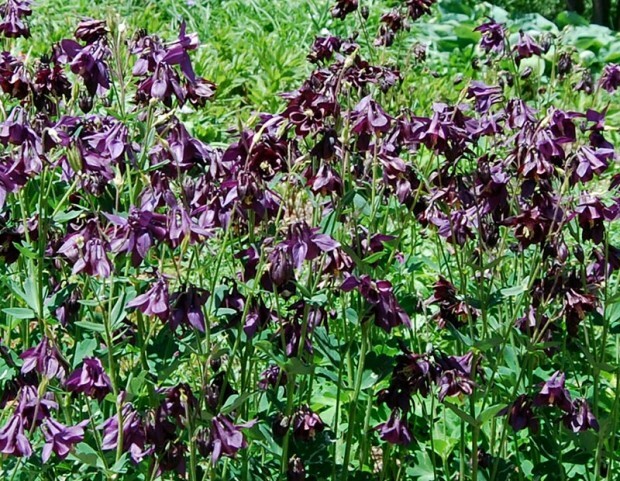 Also look for the sweetly scented, chocolate-brown flowers of Aquilegia viridiflora—very rare! Some varieties like ‘Lime Frost’ even have variegated foliage. Hybridizers have produced hundreds of variations in interesting colors and forms to keep any gardener in awe. Columbine has come a long way since its humble beginnings and deserves a place in the shade garden or even the rock garden. Try some short ones or try some tall ones, try some white ones or try some black ones. What ever your taste may be, columbine surely has a plant that’s right for you. Plant is short-lived: 1st year: young plants may not flower; 2nd year: peak blooms; 3rd year: weaker blooms; 4th year: not likely to overwinter. However, many plants will drop seeds that germinate for the following season. Ideally, grow columbine where other plants will camouflage the plant’s fading foliage in midsummer. What is causing my columbine to brown and drop its foliage every spring? Over the past couple years, I have noticed the same two things happen to my columbine foliage each spring. After the plants reach peak bloom, the leaves start to get curvy, light brown lines though them. Shortly thereafter, all the foliage is gone, seemingly overnight—bare stems are all that remains. The plants bloom well each spring and the foliage is healthy before the problems occur. Should I be doing anything about this? Columbine is one of the loveliest plants for the partial shade garden. Its susceptibility to columbine leaf miners is one of the few disappointing aspects of this perennial. This annoying little critter that likes to decorate columbine leaves with its winding, whimsical and white trails belongs to the family of leaf-mining flies. The pale brown adult fly lays its eggs on the underside of the leaves where the eggs hatch and the larvae that emerge penetrate the leaf and live between the upper and lower surfaces of the leaf. They feed on the inner leaf tissue, creating winding trails usually light green, light brown or white in color. The infested leaves may turn white and die. Spraying the infested plant with a systemic insecticide is the best solution to the problem. Orthene or Cygon are two Ortho brand products that will work well for the elimination of these pests. You may also use these products as a preventative measure by applying the insecticides to the foliage before it is infested. As with all insecticides, follow the directions on the package carefully. It is also recommended to remove and destroy any infested leaves. Also, be sure to rake out and destroy any foliage remains in the fall. The “here today – gone tomorrow” mystery surrounding columbine foliage is a problem entirely separate from the designing leaf miners. Foliage stripped off in one day leaving nothing but a columbine skeleton can be blamed on chewing caterpillars. These tiny, green, munching machines attack plants in late spring and early summer, just as your columbine is coming into full glory! Columbine’s beloved delicate and thin leaves are the perfect texture for their insatiable appetites. Usually flowers and stems are the only remnants left standing, bobbing in the wind. All is not lost, however, as the foliage will grow back in the same season and the plant will certainly return year after year since the root system is not affected by the caterpillars. Protecting the new growth, before or after a caterpillar attack, is the key. As with the control of the leaf miners, Orthene or Cygon are your best bet to get rid of the caterpillars. Apply early in the season before these pests can do any damage, usually the end of May.